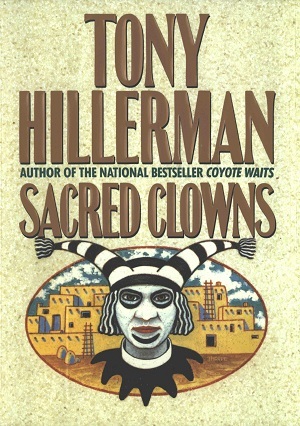 This is the first edition of Sacred Clowns, which is the eleventh Tony Hillerman Navajo Mystery novel featuring Joe Leaphorn and Jim Chee of the Navajo Tribal Police. This edition was published in 1993 by HarperCollins Publishers Inc. in New York City, New York. The cover art was designed by Peter Thorpe, who designed a majority of the American covers. This edition's cover features a koshare or Pueblo Sacred Clown with a pueblo village in an oval in the background. Format: Hardback, 24.2 x 16.2m. Binding: Orange boards with linen colored cloth spine and a design embossed in gold on the front. The author, title, and publisher's name are printed in gold vertically on the spine.